Director Andrei Konchalovsky at the premiere of his film 'Paradise' in Moscow. 'Paradise' by Andrei Konchalovsky ranks as the most successful Russian film on the international festival circuit in the past year. The film won Best Director at the Venice Film Festival and was shortlisted for the Oscars, in the Best Foreign Film category. There are two main characters in Paradise. One is SS officer Helmut, who arrives at a concentration camp to investigate corruption. The other is a Russian princess Olga, an émigré who has joined the ranks of the French Resistance and has been sent to the camp for hiding Jewish children from the Gestapo in her apartment. At some time before the war Helmut and Olga had a fleeting holiday romance. And now the protagonists are faced with a painful choice. He faces risking his career and beliefs in trying to decide whether he should save his youthful love from the gas chamber. She needs to answer the question: What is more important - saving her body or her soul. 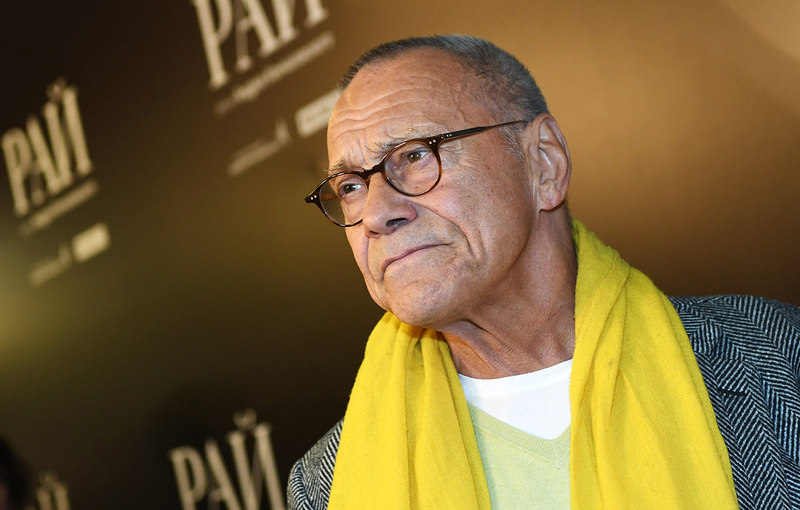 In the next few weeks, Paradise will roll out at cinemas across Europe and the U.S. RBTH talked with Andrei Konchalovsky ahead of the film's premiere. The film is about the Holocaust. On the one hand, the theme is inexhaustible in world cinema but, on the other, many regard it as opportunistic. It is no coincidence that in the past two years films from Eastern Europe about the Holocaust have won Oscars. Have you heard any reproaches yet? No, I haven't, but I am ready for any reproaches. After all, what is a reproach? It is just an interpretation of what a person has seen on the screen. When watching Paradise, someone may think that it is a film about the Holocaust. Well, I don't mind. In the reality system of the viewer who will think thus, it may be so. I have deliberately removed everything clear-cut and unambiguous from Paradise. And because of that, I am now being asked - what about the scene in which your heroine throws herself on the SS officer and says that he is a representative of great nation that has the right to commit all atrocities - is it accusatory or ironic? I never give a direct answer to this question. It may be accusatory. Or maybe it is ironic. Let me say the following, so that we don't get bogged down on the first question: For me, Paradise is definitely not a film about the Holocaust. It shows the tragedy of the Jewish people, but this is not the main theme of the film. For me it was much more important to make a film about the charm of evil. The main character in the film is an SS officer, an incredibly well educated and attractive man. But that is the horror. This officer of yours, by the way, is almost a spitting image of the character in the novel by Jonathan Littell, The Kindly Ones. It is not an accidental parallel, is it? No, it is not accidental. You are absolutely right - the idea of Paradise was greatly influenced by this novel. I read it several years ago and was completely blown away. I thought such a novel was simply impossible - an absolutely documentary novel, written in the first person, and at the same time offering the reader the chance to immerse themselves in the heart of darkness. I was even thinking of making it into a film. But I am not at all sure that The Kindly Ones is suitable for film adaptation. Yet I am pleased to hear that you could discern Littell's novel in the film. So far Paradise has met with a positive reception internationally - festival awards, the Oscars shortlist and guaranteed public attention. Is it important to you that the film is perceived correctly in the West? To me, everything that happened to Paradise in Venice and at the Oscars belongs to the category of pleasant surprises. Thank goodness it has all happened this way - that at a time of unprecedented attacks on Russia in the West, they will be able to see a film that will explain something to them about Russia and the Russians. I think they will understand everything correctly in it. With Germany it is more complicated. In general, I find the state of the German nation catastrophic. Not because of the immigration and not because of the fact that they are under American occupation. They are occupied in the literal sense - since World War II, 80,000 US soldiers have been stationed there, and still are. But the nation is in a catastrophic state because a sense of guilt was hammered into it. It is one thing when a sense of guilt arises spontaneously and in that generation which can and must take responsibility. But it is quite another to hammer it into people so that they are so afraid of being politically incorrect that they are frightened of their own shadow. It is painful to watch. They have no culture; it was completely destroyed. I hope that the great German spirit will arise again. It doesn't mean that this spirit should lead to Nazism. The German spirit is embodied in Hegel, Nietzsche and Schopenhauer. It is that part of European culture without which even we cannot exist; we too have been influenced by Hegel, Nietzsche and Schopenhauer, even Vladimir Lenin was influenced by them. I think that the Germans will be watching this film with horror, constantly looking around and being afraid to say what they think about it. I've talked to them, they lower their eyes and blush. It's very hard for them. But the new generation is not to blame for anything! It is their grandfathers who found themselves in that tragic, murky and terrible Nazi river. But what do their children and grandchildren have to do with it? That's why sublimation sets in and skinheads and other thugs appear there. At the same time, German actors play the main characters in your film. Do you know what the most interesting thing is? Actors who live in the eastern part of Germany, which used to be Soviet, play Nazis with pleasure. But all those who live in the western part categorically do not want to do this. This must have something to do with psychology. They are still afraid - it has been hammered into them. Therefore the Germans who played the main characters are all from East Germany. And Himmler is actually played by a Russian actor, Viktor Sukhorukov. With Paradise you have returned, after a long break, to international cinema in every sense of the word - you made the film in several languages on location in Germany and France and the crew was European. Was there a clash of mentalities? The main problem was that people who work in my group do not think about hours. I have to think about them. They don't think about when they should start or finish working; they are emotionally involved in their work. But in Germany - it is either straight or at right angles, nothing happens on the diagonal. They found it strange that we stayed two hours overtime to shoot something. And they found it strange when we were shooting for six hours a day instead of 12. We came on location, did the shooting and finished for the day. We went home but they stayed for another six hours - to earn their salary, despite the fact that there was nothing to do. In this sense the two mentalities do not coincide. We understand them, but they do not understand us. As for the actors, there were no problems there - their passion for the material was as it should be. In one interview you said that with your previous film, The Postman's White Nights, a new period in your work had started. Does Paradise continue this period? Yes, of course. You yourself must have noticed that the two films I made in the 2010s are very different from what I had been doing 10, 20 or 30 years ago. Perhaps only when I was young did I shoot something similar. Did the failure of The Nutcracker, which you made in Hollywood six years ago, influence the process of your transformation as director? Everything has influenced it, including that. Little did I realize at the time that Hollywood offers a Russian film director nothing. You are needed there only as a craftsman but if suddenly you show ambition a bit above the average level - that's it, they start putting a spanner in the works. So I have no desire to go back to Hollywood with its existing hierarchies where we are allocated a place somewhere at the bottom of the pyramid. By the way, did you notice how Paradise is shot stylistically? Do you mean that for almost half the film your characters sit and talk to camera? Precisely. To write a script in which for half the film people just look at the camera in close-ups and talk - in a sense it's completely mad. If I had given such a script to a Hollywood studio, they would have told me: "Have you gone mad?" Therefore I am happy that I now live in Russia where such madness is possible. Alas, we ourselves often don't realize what a free country we live in.